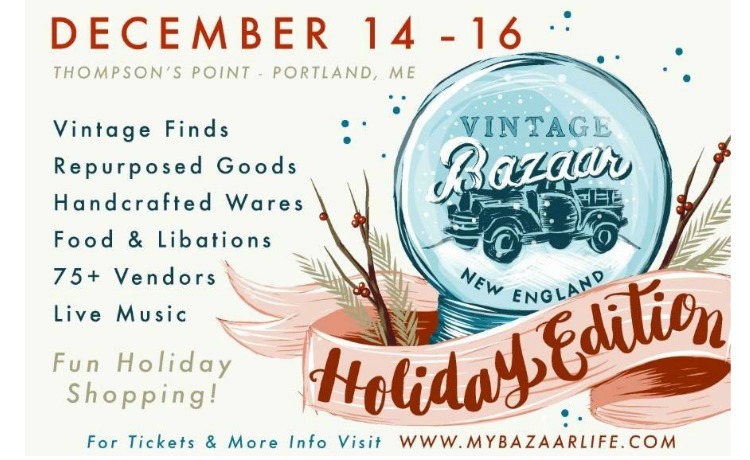 Vintage Bazaar New England – Holiday Edition – Portland, Maine!! Come celebrate the spirit of the season and have a bazaar good time at the Vintage Bazaar Holiday Edition on December 14th-16th at Thompson’s Point in Portland. 75 talented vendors, displayed inside a historic 25,000sqft brick industrial building, will offer thoughtfully decorated and curated booths with exceptional vintage treasures, holiday treats, upcycled salvage styles and unique handmade gifts. Join in the merriment as VBNE Holiday Edition kicks off Friday, December 14th from 5pm to 9pm, December 16th and 17th from 10am to 4pm. General Admission is $10 and Early Bird/Weekend Passes $15. Whether it’s festive ideas for holiday decorating or one-of-a-kind gifts, VBNE Holiday Edition will be brimming with items to deck the halls and warm the heart.